The controversial East Coast Rail Link (ECRL) project has finally gotten its answer after being suspended for 10 months. 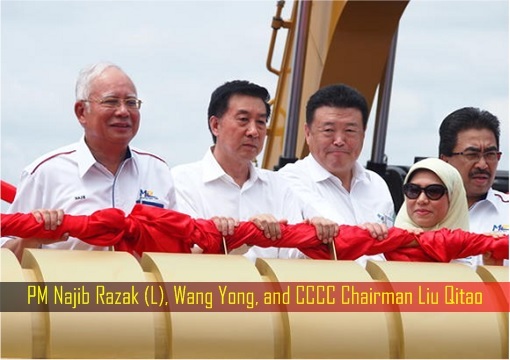 Its main contractor, China Communications Construction Ltd (CCCC) received a notice to suspend all work on July 4 last year after Pakatan Harapan formed the new government of Malaysia, upon a spectacular downfall of the Barisan Nasional coalition. 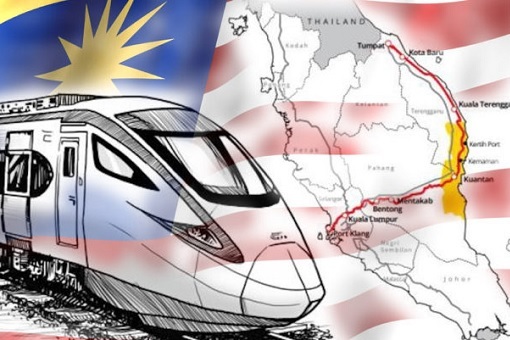 As expected, Mahathir administration was not able to cancel the ECRL simply because the project is too important to China, either economically or geo-politically. 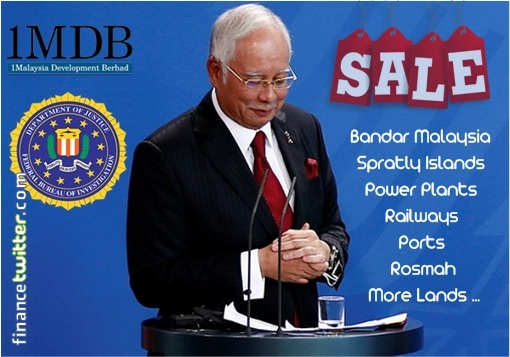 From the beginning, former Prime Minister Najib Razak had signed an extremely lopsided and unfair deal with Beijing in exchange for RM30 billion kickbacks so that he could bail out his 1MDB pet project. Back in 2016, the Sarawak Report exposed Najib’s secret deal with China to pay off 1MDB massive debts, jacking up the ECRL project cost by a whopping RM30 billion of taxpayers’ money to rescue his crumbling 1MDB project. The meeting minutes were later found and published by the Wall Street journal, confirming the crook’s extraordinary efforts in stealing money. In his eagerness to pocket the RM30 billion to cover-up his 1MDB scandal, Mr. Najib did not even care about the agreement signed with China. It would have cost Malaysia an eye-popping RM65.5 billion to build the ECRL. The new government of Mahathir, however, managed to re-negotiate with Beijing and as a result, the cost was reduced to RM44 billion – a saving of RM21.5 billion. Make not mistake about it. The saving of RM21.5 billion or 32.8% was only possible due to the special relationship between Malaysia and China, a privilege that other countries do not enjoy. The new deal goes to show that the Chinese still make good profit even after giving the massive discount. Can you imagine what will happen if Najib is still the prime minister? Had PM Mahathir and PM-in-waiting Anwar failed to defeat Najib Razak in the 14th General Election on May 9, 2018, the country would have fallen into the debt-trap, allowing China to probably use the debt to obtain strategic assets or influence in Malaysia. Like Sri Lanka’s deep-sea Hambantota port and Mattala Rajapaksa International Airport, Malaysia’s ECRL would become another white elephant. Still, does Malaysia really need the ECRL? The answer is a big “NO”, even after the original proposed cost is cut by a third. But what choices did the new government have? 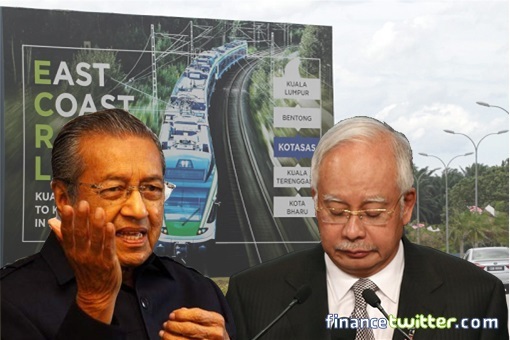 As admitted by PM Mahathir, the government decided to go back to the negotiation table on the East Coast Rail Link project because a termination would cost RM21.78 billion with “nothing to show for it”. Adding salt to injury, RM20 billion on the project cost had already been paid, being the payment for 20% of the phase one of the ECRL project, therefore, it didn’t really make sense to pay more than RM40 billion just scrap it. Trapped, the only option left was to re-negotiate for a better pricing and other adjustments to make full use of the infrastructure, not to mention ways to reduce the risks. As a start, the length of the rail link will be reduced from 688-km to 640-kmthrough a realignment. Originally, the line was to run from Port Klang in the state of Selangor to Kota Baru in Kelantan state, involving two other states – Pahang and Terengganu. With the realignment, it will pass through the state of Negri Sembilan as well. To spice up the new and improved ECRL deal, the rail link will also be running through Putrajaya to inject higher connectivity for the federal administrative capital. The new alignment would leverage on the existing KLIA ERL as well as the future MRT2 SPP line with an interchange in Putra­jaya Sentral – an attempt to make Putrajaya a rail hub. With the new price tag or RM44 billion, the construction cost for the project is now at RM68 million per km, against RM98 million per km originally. In other words, Najib might have benefitted RM30 million for every kilometer the ECRL is to be built. The new alignment will also avoid the construction of the 17.8-km long Genting Tunnel from Bentong to Gombak. Najib and his boys did not even try to avoid the extensive tunnelling work, which was a major cost component of the project. 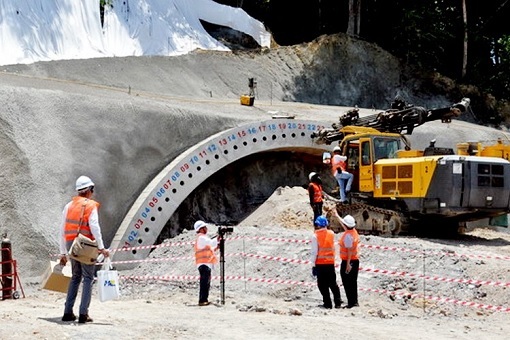 Perhaps it was deliberately proposed for the bragging rights whereby Najib could gloat to his gullible followers that his administration has created the longest tunnel in Malaysia and the region. But the tunnel would have cost the country at least RM8 billion more. The revised alignment will preserve and protect the Klang Gates Quartz Ridge and the nation’s silica reserves. With the dimension of more than 16-km long and 200-m wide it is the longest pure quartz dyke in the world. Under Najib regime, not only the most expensive method to build ECRL was purposely chosen, they also disregarded the cultural, heritage and environmental factors. But protecting the quartz and the cost saving of RM21.5 billion – which could easily balloon to RM35.5 billion based on 3.25% interest rate over a 20-year loan period – was just the beginning of the re-negotiation efforts entrusted on Daim Zainuddin, former Finance Minister and Special Envoy to PM Mahathir Mohamad. A lower interest rates on loans from the China-Exim Bank are still in progress. China’s CCCC has agreed to refund RM3.1 billion advance payments under the original contract for Phase 2 – RM500 million would be refunded within a week from April 12 and another RM500 million within a month. The balance of RM2.1 billion will be fully settled within three months after deductions for verified claims arising from abortive work, suspension and cancellation of the northern extension. The improved ECRL deal will also boost the local infrastructure sector as the participation of Malaysian companies in the project would now be increased to 40% from the 30% agreed to in the original deal. In essence, this will excite the domestic construction industry, something which previous Najib regime did not try hard enough to demand from China. More importantly, Mahathir administration has succeeded in reducing the risk of the ECRL project, which the country would bear 100% under Najib regime. The China Communications Construction Company Ltd (CCCC), which is the main contractor in the project, will form a 50:50 joint venture company with Malaysia Rail Link Sdn Bhd (MRL), so that both will share the operating and maintenance costs. The joint venture to undertake the operations and maintenance of the service is perhaps the single most brilliant part of the re-negotiation. Not only such arrangement would help to ease the financial burden on Malaysia, it will ensure China delivers quality infrastructure and products as well as a long term commitment to make the project as profitable as possible. For a start, China may actively promote the usage of ECRL to millions of tourists from the mainland. With travelling time more than halved from the west coast to the east coast, the tourism sector in Terengganu especially could see a sudden influx of Chinese tourists – boosting local businesses and earning foreign exchange for the government. Although the extradition of Jho Low, Najib’s partner-in-crime, was not part of the new ECRL package, there will always be some backroom deals that could not be revealed publicly. 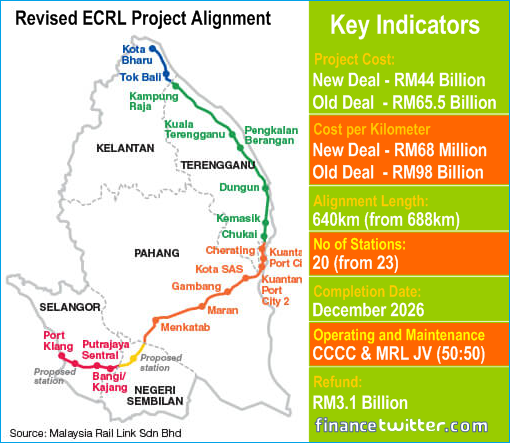 Revealing the ECRL details on Monday (April 15), PM Mahathir also said that Malaysia intends to take advantage of the revived East Coast Rail Link project to sell more palm oil to China. 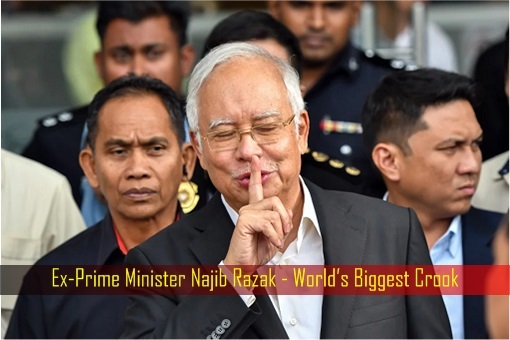 While the secret will remain sealed as to how much Najib Razak had been paid as part of the RM30 billion bloated cost in the project, the educated guess is China had not paid the former premier the full amount requested. He might have gotten a couple of billions. But had Najib won the last May election, part or all the RM21.5 billion saved would have gone to his pocket. Najib is clearly a traitor for putting the country in a debt-trap. His treasonous and treacherous act of stealing RM30 billion to cover the debts of 1MDB would have made the country poorer by at least RM35.5 billion, had the new government did not re-negotiate the deal. The Klang Gates Quartz Ridge would have been bulldozed. Alone to take 100% of operational risk, the ECRL operator will most likely go bust.